ON THE BEACH in one of Puerto Vallarta and Riviera Nayarit’s most desirable neighborhoods, CASA TORRE is a private haven for relaxing, surfing, whale-watching, and long beach walks — right in your own backyard! It’s location is Punta del Burro, a gated community of fewer than 40 homes, on the North Coast of the Bay of Banderas — 40 minutes from Vallarta, and even fewer from Punta Mita, Sayulita, and La Cruz de Huanacaxtle (Marina Nayarit). 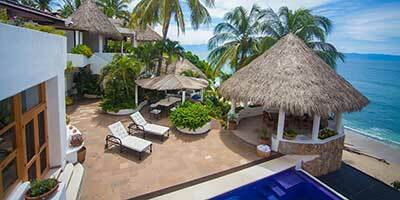 Casa Torre is recently ​constructed and fully furnished with an emphasis on quality and tradition. Its namesake stone “torre” (tower) distinguishes the street-side entry, as do its lush garden and multi-level ponds of fish and lilies. Floor-to-ceiling views of the Bay of Banderas and outdoor living area welcome you to the home’s grand room. Fully open, it offers defined spaces for living, dining, and kitchen. A presentation-style kitchen includes handmade copper sink, antique chopping/prep table, and slab granite counters that extend to a spacious bar and socializing area. Classic vintage Mexican furnishings distinguish the large dining room. The living room, 2 steps below, incorporates casual tropical-style furnishings, built-in seating, and lighted niches for displaying your treasures. Three generously-sized-but-distinctively-different master suites (king beds) offer ocean views, private terraces, and 5-piece baths. One is on the main level, the others upstairs. A 4th bedroom (twin beds or converted king and en suite bath), overlooks the entry garden. The outdoor living terrace overlooks the beach and Bay, and includes a solar-heated infinity pool; palapa-covered seating for shaded lounging, whale-watching, and cocktails at sunset; and a dining pergola with built-in gas grill and prep/serving area. The stairway to the beach curves through stone-walled gardens, arriving at a private lounging pergola. Casa Torre incorporates numerous energy-saving and environmentally sensitive features, including solar heating for the pool (and full-house capability), microplant biological sewage treatment with waste water recycling for irrigation, LED lighting systems, and windows and doors designed to assist natural air circulation and minimize heat gain.